"There is an appointed time for everything. And there is a time for every event under heaven," thus wrote King Solomon in the Book of Ecclesiastes. When I was growing up September was a time to end summer by closing up the cabin, putting away the boat, and generally wrapping up summer. On Labor Day many people would make a final trip to the cabin 'up north', and close things up for another year. There was a sense of closure, a certain finality to it all, a proper conclusion to the season. September was the beginning of fall, a time to resume the regular routines of school, work, holidays and the like. In those days we observed the seasons by regular routines. 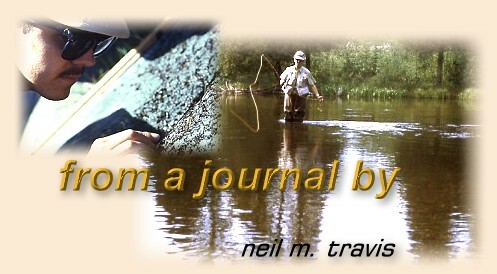 Trout season closed in many places in September or early October. Bird season came with the first chill of the fall, and deer season followed. Then we waited for the lakes to freeze so that the ice-fishing shanty could be towed out on the lake. Then we began counting the days until trout season opened again. Over time these time-honored traditions began to change. No longer does September mark the end of the season. Trips 'up north' to the cabin extend far into the fall, and for many folks the cabin is never unoccupied, even in the depths of winter. Closing trout waters during the winter went out of fashion in most states and with it the traditional opening day. Suddenly there were no endings. On January 1st I retired from my career, and for the first time this winter my wife and I will retreat from the snow and cold of Montana to our winter home in Tucson, Arizona. This change of venue brought an ending back into my life. For the first time in 40 plus years I have put away my fly-fishing gear; emptied out my fishing car, stored my rods, my vest, and all my fishing paraphernalia in preparation for our departure to a place where trout don't live. As I picked up each piece of gear to store it away I realized that the years had slipped away faster than I had imagined. The end of an era in my life was drawing to a close, and there was a bit of sadness as I stored away my gear.